When wanting to have your vehicle protected against an attempted theft our vehicle specific ready kits with their step-by-step system-to-vehicle installation manuals will guide you to getting the job done faster & easier! All our VSS Kits arrive at your door complete with all the parts and information you'll need to install the system into your specific vehicle. And if you have any questions before, during or after the install, we have professional installers on call 7 days a week to answer any questions or problems you may have. Have the VSS Advantage™ on your next installation today! Advanced SST Remotes "Spread Spectrum Technology"
Not only are the remotes to the 596-VSS one of the best in quality they are designed with the most secure form of radio frequency transmission technology currently available on any automotive system today. In addition to nearly eliminating any RF interference and providing quicker response and stronger range, this latest technology shift's the transmitters operating frequency continuously making it impossible for a thief to copy and rebroadcast your transmitter's code. 5-Button remote (3 on the side) back-lit indigo blue screen that runs off of a single AAA battery (included) for several months with a battery-saver mode setting for even longer battery life. 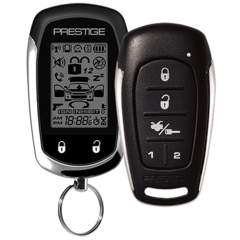 It's 2-way confirming abilities will enable you to confirm doors locked/system armed, unlocked/system disarmed, power trunk activation and paging capabilities when the alarm is triggered all on the LCD screen and all within 2500 feet of your vehicle. The system monitors all vulnerable entrances to the vehicle and will instantly trigger the alarm before a door is opened 2 inches. Adjustable sensor that can detect lite and heavy impacts made to the vehicle. External shock impact sensors eliminate the need to mount the systems main control module in a fixed-stationary position and allow's easier placement of the sensor so it can be reach easily under the driver's dash for quick adjustment's. Whenever the system is armed, any strong impact to the vehicle's exterior will cause the shock sensor to fully trigger the alarm. Any lesser impact will cause the pre-detect stage of the shock sensor to emit a few short series of warning tones from the siren or the vehicle horn. Visual confirmation when you lock/arm or unlock/diarm the vehicle's doors and flash when the alarm is triggered. No surfing the internet, no videos to watch, no sitting with a lap-full of "spaghetti-wire" and jumping from wiring chart to manual, trying to figure out what wires are needed (or not needed) to connect to your vehicle. Every VSS system include's a step-by-step vehicle specific installation manual to indicate exactly what wire from the system connects to what wire in the vehicle, where the wire is located and how to confirm that you found the correct wire using the VSS kits supplied LED style test probe. Most of our VSS manuals even include color photos of the wiring in the vehicle. To avoid the inconvenience of getting into the middle of an installation and finding out that you need to stop and run to the auto parts store for a relay or radio shack for some resistor's or whatever, we include any needed extra relays w/harness (for example, for power trunk activation) and/or diodes, resistors, voltage inverters, etc. needed for your specific vehicle. You will be asked to indicate the year, make and model of vehicle the 596-VSS system will be installed into during ordering. If in the rare event that one of our technicians finds that the system is not available in the VSS platform for your specific vehicle, we will immediately email you, cancel the order and promptly release your payment. Repair or replacement of any part of the 596-VSS system (excluding remotes) that's found to fail from manufacturer quality under normal every day use for a period of 3 years from date-of-delivery. 1 year on remotes.